Our company is largely focused on the marine industry that is so prevalent among port cities worldwide. The specialized designs for saturation dive systems are increasingly necessary to meet the demands of an expanding market for subsea installations and repairs. Our success in this unique industry can be credited to our dedicated staff of engineers and designers using cutting edge technology, coordination and review efforts with classification societies and our continued involvement throughout construction. This project included the design of a 3-Man side-mated Diving Bell, 12-Man Hyperbaric Rescue Chamber (HRC), 6-man Deck Decompression Chamber (DDC), quick closures clamps, transfer trunks and the launch system for the HRC. The system was classed by American Bureau of Shipping (ABS). 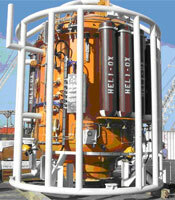 FMS Engineering designed this 3-man 1,000 ft rated saturation diving bell. The bell is ABS Classed and designed to comply with ASME PVHO and IMCA requirements. 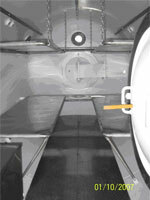 This ABS classed Hyperbaric Rescue Chamber was designed to evacuate up to twelve divers. 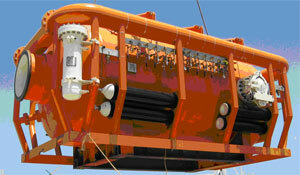 The chamber meets the requirements of SOLAS, IMO Code of Diving and IMO Life-Saving Appliance Code. 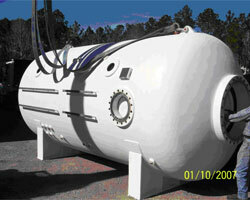 This is a video clip of the launch of a 12-man Hyperbaric Rescue Chamber. 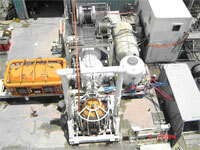 FMS Engineering designed this 6-man 445 psi rated Deck Decompression Chamber used as part of a saturation diving system.